China outranks the United States in many areas. It is the largest consumer of energy, the largest producer and consumer of coal, and the largest importer of petroleum. It is also the largest generator of electricity and the largest emitter of carbon dioxide—the most abundant of the anthropogenic greenhouse gases. China needs energy to support its economic growth and to improve the life of its citizens, so it invests in energy-producing countries and makes deals with countries rich in energy resources. It also does not discriminate among energy sources; coal is its largest supplier of energy, supplying 66 percent of its consumption in 2012, according to the Energy Information Administration (EIA). (For comparison, coal makes up 18 percent of U.S. energy consumption.) Fossil fuels supplied over 90 percent of China’s energy needs in 2012, which is more than the 82 percent that fossil fuels supplied for energy consumption needs in the United States. China is also building infrastructure galore—refineries, LNG terminals, power plants of all kinds, pipelines–which provide jobs and fuel its economic growth. By the end of 2013, China’s oil companies secured bilateral oil-for-loan deals totaling almost $150 billion. China provided loans to countries that need capital to extract energy reserves and build energy infrastructure in exchange for oil and gas imports at established prices. China extended oil-for-loan deals with Russia, Kazakhstan, Venezuela, Brazil, Ecuador, Bolivia, and Angola. Several oil and gas deals have been signed with Russia in the past few years—including two loan-for-oil deals amounting to $50 billion—that each include 300,000 barrels per day of oil, transported by pipeline from Russia to China. At the end of 2013, China had about 15,657 miles of crude oil pipelines and 12,605 miles of oil products pipelines in its domestic network. In 2006, China received oil from Kazakhstan in its first transnational oil pipeline that was financed by Chinese loans. The Eastern Siberia-Pacific Ocean (ESPO) Pipeline, built in 2 stages in 2011 and 2012, brings Russian oil to China. Russia anticipates expanding the ESPO transmission capacity to 1.6 million barrels per day by 2020. In January 2015, China launched an oil import pipeline with a capacity of 440,000 barrels per day from Myanmar, which is envisioned as an alternative transport route for crude oil from the Middle East. Crude oil from the pipeline is expected to serve the Yunnan/Anning refinery that is slated to start operating in 2016, along with the Chongqing refinery, which is expected to begin operating in 2017. China’s refining capacity ranks third in the world, behind the United States and the European Union. By 2015, China’s installed crude refining capacity reached almost 14.2 million barrels per day, about 680,000 barrels per day higher than in 2013. With capacity utilization at less than 75 percent, no new terminals are expected to come online until the latter half of 2016, and only a few expansion projects are expected to add incremental capacity of less than 200,000 barrels per day in 2015. Chinese refineries are expected to meet domestic demand and to export petroleum products within the region. In 2011, China surpassed the United States as the world’s largest power generator. In 2013, net power generation in China was estimated at 5,126 terawatthours, 7.5 percent higher than in 2012. China’s electricity generation more than doubled since 2005, as can be seen in the chart below. In 2013, China generated 3,937 terawatthours from fossil fuel sources–about 7 percent higher than in 2012. Because of China’s large amount of domestic coal reserves, coal will continue to lead the country’s power generation market. However, China is modernizing its new coal plants with more efficient and technologically advanced ultra-supercritical units, which operate at the highest levels of pressure and temperature for a coal plant. Although China has prohibited the construction of coal-fired power plants around three major cities—Beijing, Shanghai, and Guangzhou—due to air pollution from criteria pollutants such as sulfur dioxide, China is building additional coal-fired capacity closer to the inland coal-producing areas and expanding electricity transmission to major demand centers. In 2013, nuclear power generated 106 terawatthours, making up 2 percent of China’s net generation. Nuclear generation is expected to increase, as China has added ten nuclear reactors over the past 2 years. China’s installed nuclear capacity was 23 gigawatts as of April 2015, located along the east coast and southern parts of the country. By April 2015, China was constructing an additional 23 gigawatts of capacity, more than one-third of the global nuclear power capacity currently being built. These plants are slated to become operational by 2019; several more facilities are in various stages of planning. Because of its cost-effectiveness and sizeable resource potential, hydroelectricity is China’s major renewable source of energy generation. China was the world’s largest producer of hydroelectric power in 2013. The country generated 894 terawatthours of electricity from hydroelectricity—18 percent of the country’s total electricity generation. Installed hydroelectric generating capacity was 280 gigawatts at the end of 2013, accounting for more than one-fifth of total installed generating capacity in China. The world’s largest hydropower project, the Three Gorges Dam along the Yangtze River, was completed in July 2012 and includes 32 generators with a total maximum capacity of 22.5 gigawatts. The dam generated nearly 99 terawatthours in 2014–the world’s highest level of hydropower generation. Another massive hydropower dam along the Yangtze River and China’s third-largest, Xiangjiaba, began operating in 2013 with four of its eight turbines. The 6.4-gigawatt project is expected to be completed in 2015. China plans to increase hydroelectric capacity to 350 gigawatts by the end of 2020. In 2013, China was the world’s second-largest wind producer behind the United States, generating 132 terawatthours—38 percent higher than in 2012. 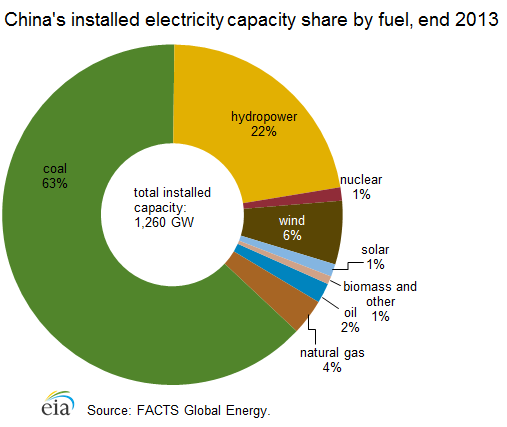 China’s installed on-grid wind capacity was 76 gigawatts at the end of 2013. However, total wind power capacity was higher at 91 gigawatts because 15 gigawatts were not grid-connected due to a shortage of transmission infrastructure to connect wind farms to the electric grid. China plans to increase wind capacity to 200 gigawatts by the end of 2020. China plans to increase its solar capacity from 15 gigawatts at the end of 2013 to 100 gigawatts by the end of 2020 and began providing generous financial incentives for solar equipment manufacturers in 2012 to spur the growth. Biomass use in China is relatively small, mostly for heating and cooking in rural areas, and for small-scale power projects. At the end of 2013, the total installed biomass power capacity in China was 10 gigawatts, with a targeted capacity of 30 gigawatts by 2020. At the end of 2013, China’s installed electricity generating capacity was estimated at 1,260 gigawatts–almost 90 gigawatts more than at the end of 2012 and doubled from 630 gigawatts in 2006. EIA projects installed capacity will double to 2,265 gigawatts by 2040, from a combination of coal, nuclear, natural gas and renewable sources. 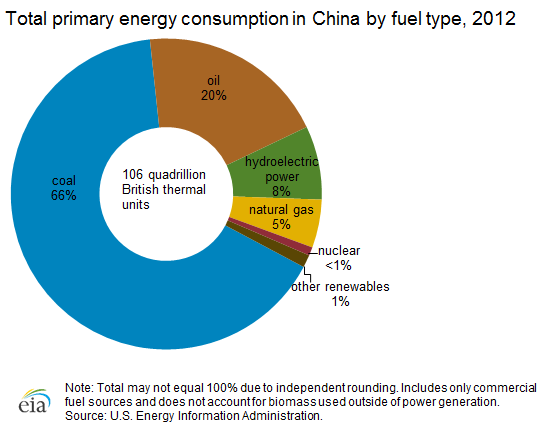 Fossil fuel-fired power capacity has historically made up about three-fourths of installed capacity in China, and coal continues to dominate the electricity mix with 63 percent of total capacity in 2013. (See chart below.) 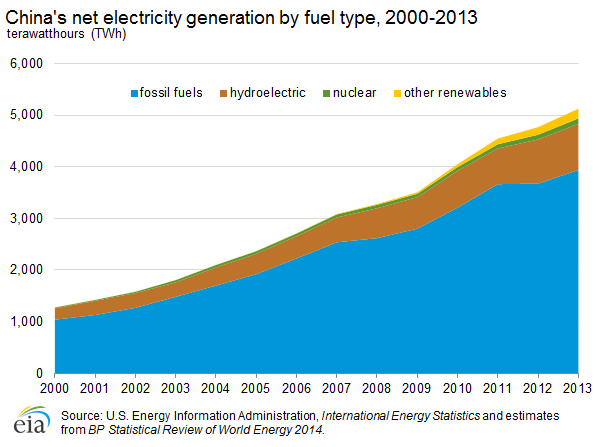 Installed fossil fuel-fired capacity was 863 gigawatts at the end of 2013. In contrast to China, the United States is not building coal-fired capacity due to a proposed regulation from the U.S. Environmental Protection Agency that limits the amount of carbon dioxide emissions that a new coal-fired plant can emit. The proposed rule makes it impossible to build a coal-fired plant unless it has carbon capture and sequestration equipment, which is prohibitively expensive and not yet in commercialization in the United States. Except for a few new nuclear units under construction, only natural gas and renewable power plants are being built in this country. China is building pipelines, refineries and coal-fired power plants—facilities that are difficult to build in the United States due to onerous regulations from the federal government and demonstrations and/or lawsuits from environmental groups. This means that China will continue to set records for energy consumption and production that exceed that of the United States, augmenting the growth of its economy at 7 percent per year for the foreseeable future.